To mix the sound brutality of Death Metal with the technical catchy insight of Thrash Metal is an old formula that exists in Metal. Although my words could be pointing to bad ideas, this equation can render good fruits even today. It depends a lot from the musicians’ personalities and the approach used by them. But we can have a fine example of a good work on this genre on the work of the Italian quartet ULVEDHARR. 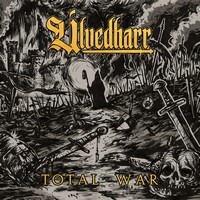 Their third and new album, “Total War”, is a fine proof of my words. Being brutal and nasty, but using the catchy elements from Thrash Metal and even some subjective melodic lines, the quartet shows a very good work, being fast and aggressive in some parts, on others moments uses a bitter and slow insight, but always heavy as Hell. Their songs shows personality, using some elements that we saw on the work of bands as DISSECTION and LORD BELIAL on their earlier works, but with an 80s insight (but don’t have the wrong idea, because they know how to use modern elements as well), so be prepared, because they are at war, and they will win at any costs! The sound quality is brutal and nasty, but clear in a way we can understand what the band is playing clearly. Some of their instrumental tunes could be better, but in the way the results are shown, we can say that they aren’t bad. And the artwork for the cover is simple, but efficient. Nine holocausts in musical form are waiting for our ears, all of them showing a talented band that knows exactly what they are doing. But the brutal blow in the ears called “Wolves” with its nasty and catchy guitars, “Flagellum Dei” with its simple arrangements and aggressiveness that comes from the 80s, the bitter melodies and excellent violent harmonies created by the guitars on the “Total War” (along with excellent work from bass guitar and drums), the hooks in the slow parts of “Wrath of Brenn”, the brutality that flows from simple arrangements of “Master of Slavery” (very good aggressive vocals, indeed), the fine Black/Thrash Metal rhythms of “Legion”, and the oppressive sound mass created on the catchy “The Dark Age” are their finest moments. These guys have guts, and I hope that “Total War” can become their statement of conquest!